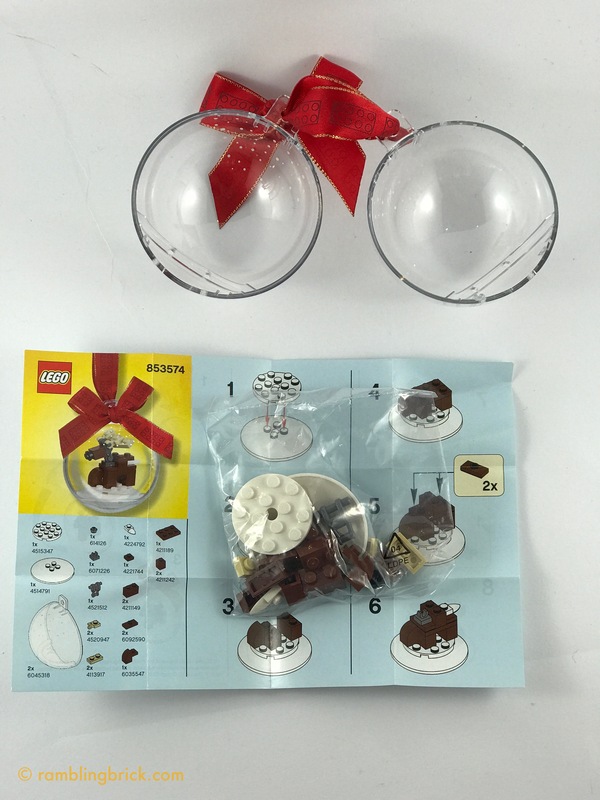 I just put together this little Christmas decoration that I picked up at Billund Airport early this year. It is 853574: Christmas Ornament Reindeer. But it just as easily be well be 850852: Christmas Ornament Reindeer from 2013. Both pieces feature a bauble containing a brick built reindeer. Both have 21 pieces. Both have a white radar dish that slots into the hemispheres of the decoration. The reindeer is simple to put together. In fact opening up the decoration took longer. The ribbon is red, with gold thread along either edge and with 2×4 bricks/plates printed along its length. I suspect they are essentially the same build. The hemispheres are held together with three sticky dots, and contains a cardboard standup with a picture of the completed build on, an instruction leaflet and a small bag containing all the parts. There is no need to untie the ribbon to open the decoration. Construction is simple, with use of a droid body as the basis of the head of the reindeer. The use of a reddish brown curved brick gives a feeling of movement. The default nose colour is black, but I felt contractually obliged to substitute a red one in. It hangs nicely in the tree, but the shadows make it difficult to photograph. It will make an appearance on the @ramblingbrick Instagram feed once I capture a decent one of it on the tree. This is a quick, simple build, which didn’t detract too much from the family activity of decorating the tree. The thematic material is good, and the final appearance is awesome. 4 out of five arbitrary praise units.